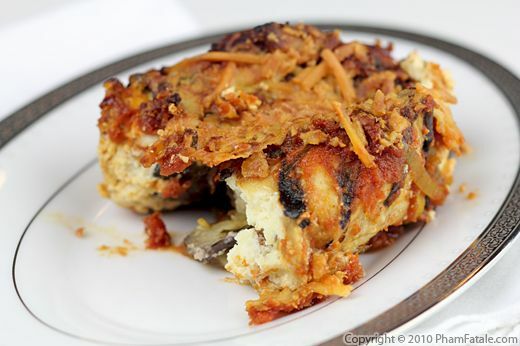 Eggplant rollatini (rolled and baked eggplant) is one of our family's favorite dishes. It is basically a twist on eggplant parmesan, minus the breading and frying. Grilled sliced of eggplant are rolled and filled with fromage blanc, then baked in tomato sauce. 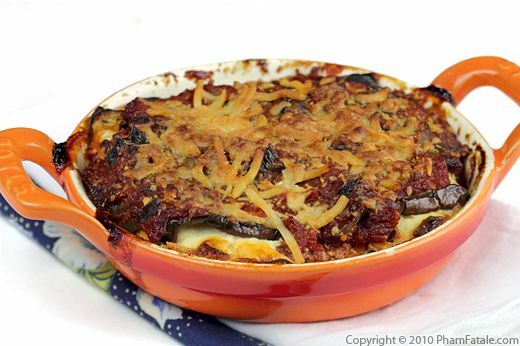 Eggplant is a vegetarian's delight; the thick slices of eggplant provide a meaty texture, while the fromage blanc supplies a luscious, creamy filling that contrasts with the crunch of the almonds. The dish takes quite a bit of time to make, but your hard work will definitely be rewarded. It is ideal if you're searching for a great comfort food recipe. 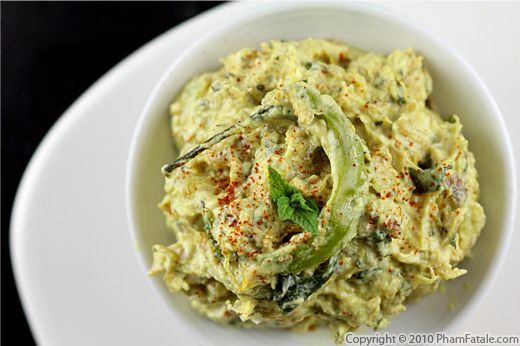 If you're an artichoke and spinach dip lover and don't feel guilty about the calories, baigan bharta is for you. 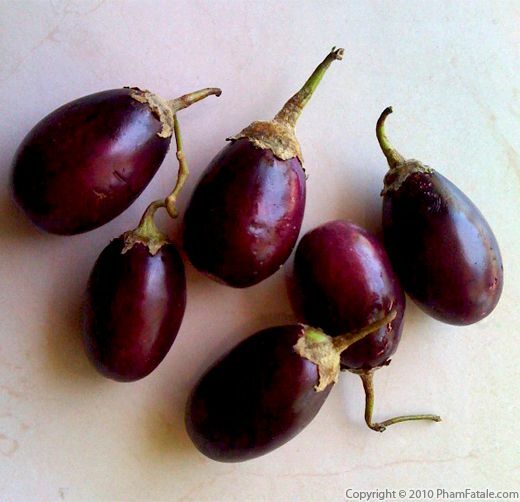 Eggplants are chopped into small pieces, boiled until softened and drained. Then they are sautéed in oil until all the liquid has evaporated. After that, the eggplants are flavored with onions and many Indian spices. Once the mixture cools completely, yogurt is added and folded into the eggplant mixture. 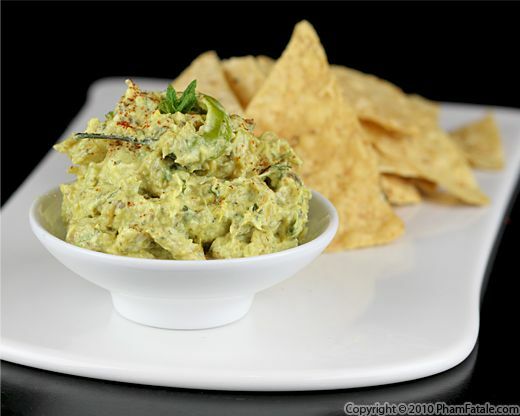 Raw onion is also added for a little bite to the Indian-style dip. Though non-traditional, I also add fromage blanc, which helps give a creamy and rich texture to the dip; it's also lower in calories and has less cholesterol than cream cheese. Today was Game 1 of the World Series, featuring our hometown San Francisco Giants. I made this dish and served it with warm tortillas chips for Lulu and the girls to munch on while they watched the game. I don’t understand baseball, but I can definitely say that the food was a home run. That’s a baseball term, right? I bought 2 fresh crabs from the seafood market and was planning on making my favorite dish: tamarind crab. But as I was prepping the ingredients, we had surprise guests for lunch. So I improvised a crab salad with what we had available in the kitchen. 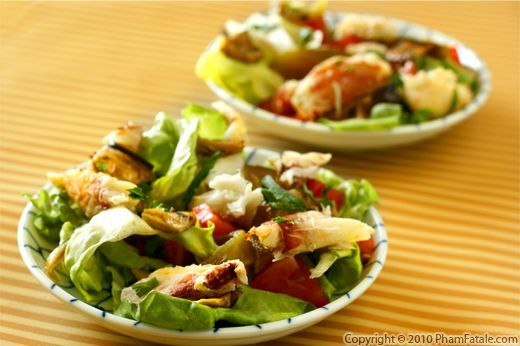 All the extra ingredients and flavors in the salad help stretch the number of servings you can get out of 2 crabs, which is perfect when you’re entertaining. To begin with, I boiled the crabs, removed the crab meat and drizzled it with lime juice. I added roasted green bell pepper, tomatoes, avocado and grilled eggplant. I served the crab salad with a flavorful wasabi-coconut salad dressing and toasted bread on the side. 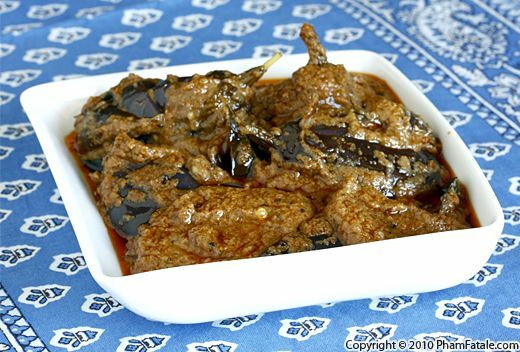 Baghare baingan, also known as eggplant masala, is one of my father-in-law's favorite dishes. I learned how to make the Indian eggplant dish in thick masala sauce from Lulu's late grandma Baji. This South-Indian vegetarian dish is a specialty from Hyderabad, the city where Daddy is from. It's quite pleasing for vegetarians and non-vegetarian eaters alike as the eggplant have a very meaty texture. The cooking procedure requires several steps. First, the small eggplants are deep-fried to soften the firm flesh, then it's simmered in a thick sauce made from peanuts and sesame seeds. The dish is finished with baghar, which is the final red oil layer commonly in a lot of Indian dishes. For this dish, you should use Indian eggplants. They have a shiny skin and a firmer flesh with less bitter taste than regular eggplants. Their flavor is fairly mild, but like other eggplants, the flesh acts like a sponge and absorbs all the strong flavors of the sauce. Make the effort to find these eggplants at your local Indian supermarket; it’s worth the try! Salade de riz aux légumes is my attempt to serve my family healthy food that doesn't sacrifice flavor. As you may have noticed, I have a tendency to make food that is a bit rich. We're all trying to workout more and get into good shape, and while I won't ever give up butter and cream, I've learned that I don't have to put it in every dish. 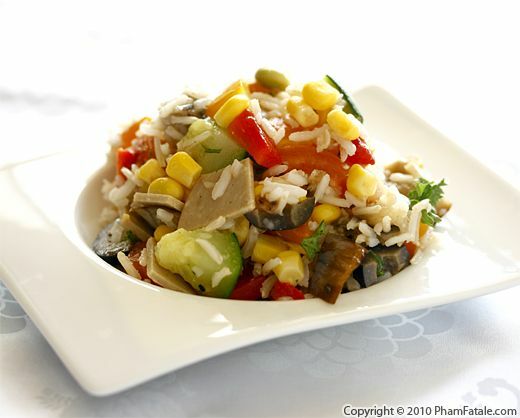 The rice salad is made with a blend of both brown and white rice for a balanced texture. I also added a mix of vegetables that are available this time of the season (the zucchini and squash are from our garden). I used fresh steamed corn, roasted bell peppers, diced tomatoes, grilled eggplant, edamame and tofurkey. Since there is no cheese involved, I was afraid the rice salad would lack flavor, so I made spicy vinaigrette. Since I still need "real" protein besides the edamame beans and tofurkey, I added smoked turkey in a separate batch. Everyone enjoyed it, myself included!